Countdown to More Infamy! T-Minus 3 Days! Have you seen the movie Ted? You know the thunder buddy song? That’s exactly how we think of bugs! So we’ve spent a lot of time going over the game in the six months since release. We’ve looked at all the bug reports submitted to us, all the posts made on our forums, in the Steam community, on GoG and anything posted in a myriad of other places. We’ve then gone through each and every one of those issues and reports and made changes to the game, making it even more awesome than you already thought it was! While the majority of things fixed were minor (grammar and spelling issues – which as a side-note were generally caused by our non-American writers and programmers forgetting to write in American English) a few larger issues did slip through into the initial release. What you’ll notice is that some of the most noticeable changes have occurred in two particular scenes. The “Slaver Quest” in Act 2 was problematic in that it had some clipping issues (ie. Roehm would walk behind a wall instead of in front of it) and had a few situations where a guard could die in a bad position that would cause Roehm to not be able to advance past him. As the goal in this portion of the story is to kill the slaver without being seen, we’ve also made some changes so Roehm needs to make sure he’s stealthy and fast. It’s a fun scene and it now plays out the way we intended from the outset. Countdown to More Infamy! T-Minus 4 Days! It’s nearly here! Are you excited? We sure as heck are, that’s for sure and we’ll be blogging each day till Friday’s release. So once again here’s the 30 second trailer. Enjoy! This patch/update is pretty huge and we’re sure you’re going to love it, so while we’re getting the final few “i’s” crossed and “t’s” dotted over the next few days we thought we’d tell you about some of the cool new features, changes and fixes that have gone into this six month job! Quest for Infamy : Who Needs a Hero Anyway? Let us know what you think! And enjoy the wallpaper! Greetings! We all hope you’ve had a very nice Christmas and relaxing break over the holidays. 2014 sure was an exciting year for us. In March we attended GDC in San Francisco where we got to showcase our first commercial release, Quest for Infamy, to the games media and other developers from far and wide – all organised by the great folks at Phoenix Online who were our major publisher for Quest for Infamy. In July we saw the release of Quest for Infamy and we’re still to this day blown away all by the comments, feedback and kind words we’ve received on our first commercial outing. Thank to everyone who helped back the project back in 2012 and to those who purchased a copy. 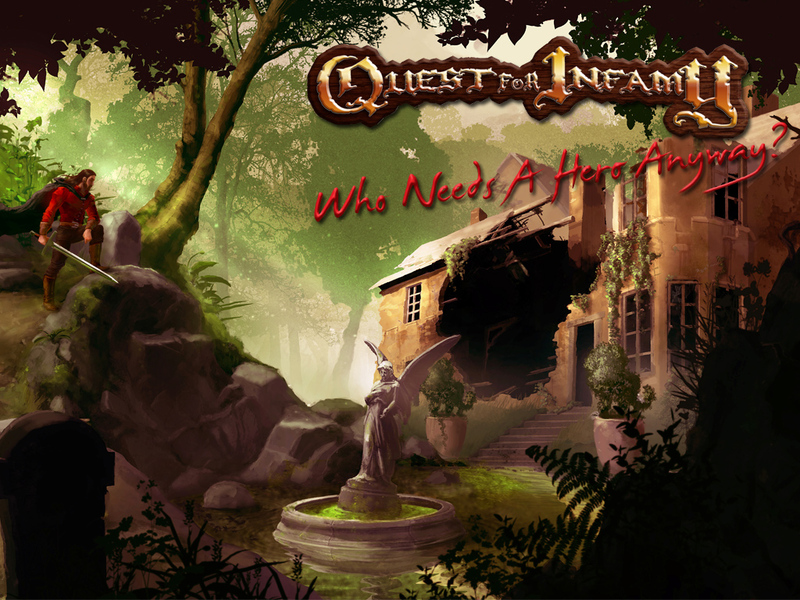 We hope Quest for Infamy thrives even more-so in the new year. The QFI update is still being worked on; we’ve been finding more bugs that resulted from changes and additions, and we still have some voices that need recording. The last thing we want to do is rush it and release a poor update, so it’ll be out when it’s out and properly ready. That will be soon though, we promise! To give you some inside information on what to look forward to, we’ve added in a new minor quest for each of the three classes. 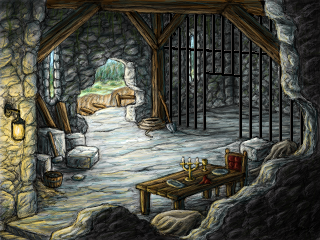 You’ll be able to access three previously unseen areas of the game, and if you’re really, really lucky you might be able to see where Voleris sleeps (and get out again alive!) A major tweak to the game is the addition of directed casting for the Mystical Unlock and the Take Inanimate Object spells (ie. you select the spell then click on the item you want to tamper with.) It adds another level of challenge to the sorcerer class and makes it a lot less hand-holdy. The stats have also been tweaked to make sure that every usage of them is tied to a minimum level of statistic (sometimes in the initial release it just worked if you had the skill). So for example, you might need a Thievery skill of 35 to unlock a door. Lots and lots more in there too and we’re working really hard to get it to you. The Quest For Infamy Companion is still being compiled and edited; with the release of the 1.1 patch, we wanted to make sure we got in all the information we could about the game. The preliminary proofs of the book should be finalized by the end of January, and the final stages of editing and locking down the manuscript should be completed by the end of February. 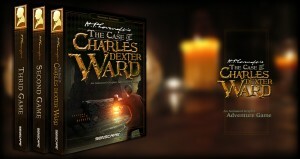 Which means we will be having the book printed sometime in March. The other physical rewards will have been completed before then – so, if all goes according to schedule, physical rewards should start being sent out by Mid-March! We’re very excited about this; creating a big box and goodies for our game is something we have all been looking forward to, and it completes our dream of creating a total classic adventure game experience. We hope you all have a great new year and we wish you all the best for 2015. We’re looking forward to another awesome year. All the best! 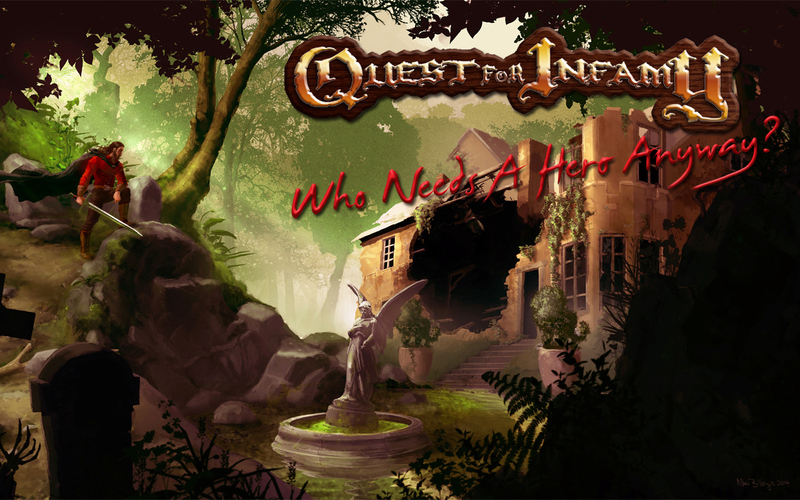 A new room by Lambonius in Quest For Infamy v1.1! Coming soon! We’re finishing up adding the details on this, and are moving into testing this version THIS WEEK. After making sure no more new bugs creep up, it’ll be time to release it to the public! 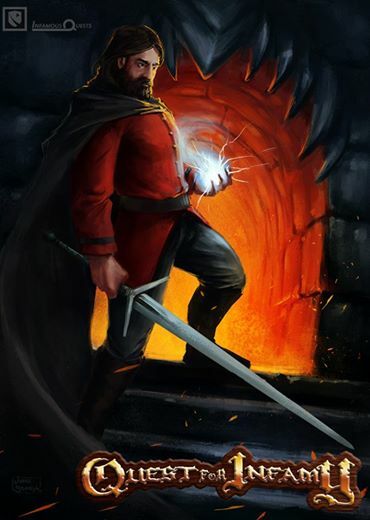 If you’ve already purchased the game, it should be updated in the store you bought it from (GoG.com, Steam, Humble, Desura) – with GoG and Humble, you’ll have to re-download the new version – Steam should update automatically after release. Yes, unfortunately, your old saves will be broken with this update. So we will be sending out another message/update before it goes live on Steam, so you can copy/preserve your old copy and saves. QFI Soundtrack – 50% off this weekend! 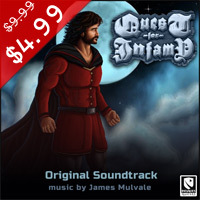 The soundtrack for Quest for Infamy is one of our favorite things about the game and this weekend only we’re giving you chance to get 50% off the official soundtrack’s price – from $9.99 to $4.99! The soundtrack features over 80 original tracks from the game, including a few tracks that never made it to the final version. It’s DRM-free too! To get started head to the QFI page or click the button below. Agustin Cordes and the team at Senscape are currently running a Kickstarter campaign to fund the development of what looks to be an amazing game, based on the based on the work of the famed writer, H.P. Lovecraft. Click here for the Kickstarter Link. Senscape are the team who brought you Scratches and Serena so they have the track record to show they can make the first official game based on Lovecraft’s work. H.P. Lovecraft’s The Case of Charles Dexter Ward by Senscape. What? That’s not a game by Infamous Quests! Why are you promoting it here, you might ask! Well the simple answer is that it looks bloody awesome and they people at Senscape are friends of ours and … we’re just damn excited about this game so go and support it already if you haven’t, or up your pledge if you have! Hey guys, just wanted to update you on the patch. Man, it’s looking good! After a few weeks rest to catch our breath, then a couple of cases of flu and a hell of a lot of catch-up on real life, Steve and I are in the final push to get this patch done. Here’s some (some – heaps more in the final version!) sneak peaks at what we’ve done! * The combat has been tweaked / fixed and the stats – in particular the % weapon hit – will now work properly. * An overhaul of two magic spells – “Take Inanimate Object” and the “Mystical Lockpick” – to be direct cast (ie. You have to click an icon on the object you want to take etc) instead of just for the room. * Some re-jigging of quests, nothing major, but making them more logical and less “but that’s the way the designers said to do it!” For example, Visa the hunter will no longer walk randomly around screens, once you find him he’ll wait there for you. And Randy will come out and have words with you if you try to push through the bushes before you know you need to. * A re-think on the monetary rewards offered for quests so that they’re now more logical and money is going to matter! You’ll need to make decisions about what to buy now, not just buy everything! * Any bugs that were reported have been fixed. Yep, every single bug that was reported to us since the game was released. Fixed. Unless of course you never told us about something in which case… ARRRGHHH! Shawn, Josh and Steve (Bt) went to GDC in San Francisco last month to show off Quest For Infamy to the public! We had several backers show up, meet and chat with us – as well as play QFI in our show loft! It was an amazing time – we were able to show the game to a lot of people, and we met some amazing people and peers! Ragnar Tornquist stopped by and showed off a bit of “Dreamfall” The upcoming Longest Journey Sequel, and I can say – it was awesome! If you haven’t seen the game play video that’s out there, check it out. I can say, it’s a really cool experience to see the developer play the game they’ve been working on, and talk with them about development, and trade war stories. He also played Quest For Infamy while there, and was really charmed by it, apparently! Heh. Jane Jensen was also there, in our loft, showing off Moebius and Gabriel Knight: Sins of The Father 20th Anniversary Edition – and she was sweet, charming and gracious to us – sharing stories of working at Sierra, working on KQ6 and sharing office space with Scott Murphy of Space Quest fame. Shawn and Steve, doing what they do, and Jane Jensen, smiling for the camera!